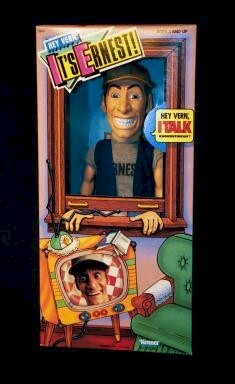 "Hey Vern, It's Ernest" was a very good show. It was not as high-tech as Pee Wee Herman's show, but it WAS very funny and entertaining. The show featured many of the same actors who also appeared in the Ernest movies. My favorite part of the show was whenever Ernest went to get a haircut and asked the barber to make him look like "a Wall Street tycoon". The barber was hard of hearing and would think he said "wall-eyed raccoon" or "wedding in June" and would make him look that way. After a shocked scream at the results, Ernest would take another look at himself in the mirror and say, "It COULD work." Website design and hosting by Sohodojo Business Services. Item 415 of 466 items displayed in viewer. 0 items in cart.